After countless requests we’ve trawled through thousands of fonts to bring you the ultimate creative font bundle! 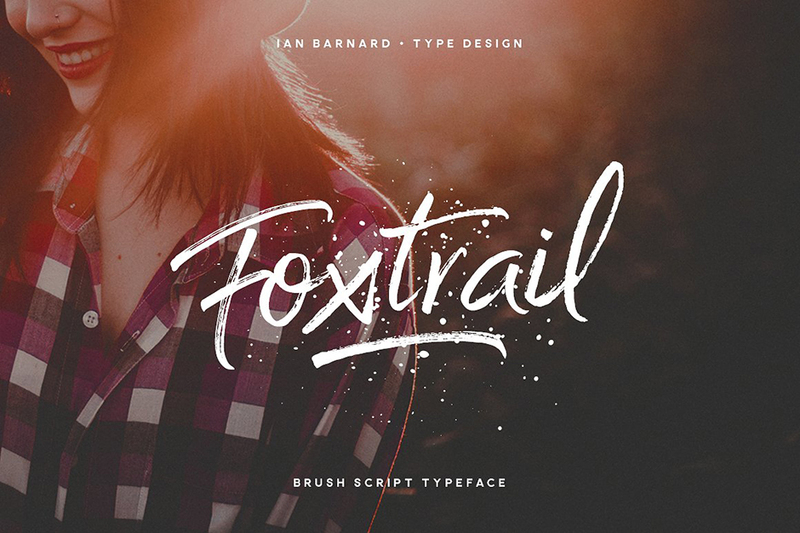 13 meticulously crafted, beautifully creative fonts that stand out amongst the rest. After lots of Design Cutters have been crying out for a font deal, we set to work to bring you the best font deal we’d ever seen. Usually deals run with fonts of this quality offer you a single font, usually in the region of $20, at around 70% off. We’ve put together a collection of 13 of our favourite all time creative fonts, at an unheard of 94% off! There is no filler in this collection. All of these fonts rock, and our team have used all of them in our regular design work. Several of the fonts have even featured in the top selling 100 design products for 2013 (stats from CreativeMarket.com). Many of the fonts come with countless variations, glyphs, additional character sets and even bonus fonts and vector packs. These font packs are bursting with value and creativity! After many requests, we’ve also worked to include web versions of 11 of the 13 fonts below (excluding CPL Kirkwood and Haimdale). This are included for no extra charge! So there you have it. The best font deal we’ve ever seen. 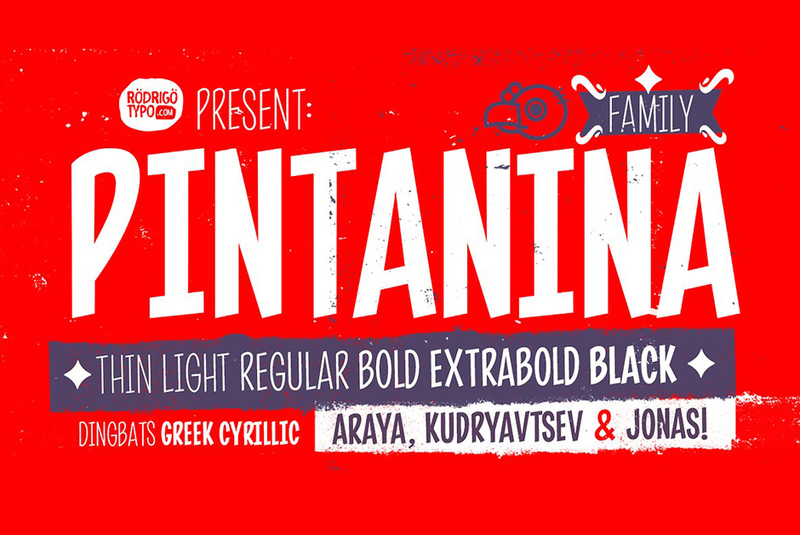 13 popular, beautifully creative fonts, bursting with extras, all for an unprecedented 94%. We’ve listened to the Design Cuts community, we’ve listened to you, now what are you going to create with them? This font includes a folder containing web ready versions. Using Lunchbox’s Opentype features gives access to over 1,500 different characters and basically creates 3 different font styles. Contextual alternatives give each letter 4 different character styles, all cycling through each other to ensure that no two letters ever show up together. There is also a custom set of small caps, each with 4 style variations as well. Stylistic alternatives give an extra handdrawn flourish, loop and slight variation, also with 4 different styles per letter. Discretionary ligatures pertain to both regular all caps Lunchbox as well as stylistic alternatives. It takes special letters and gives a unique interaction with the characters around them, giving your design a unique and personalized look. Swashes also have four style variations to both the regular and stylistic alternatives, as well as lowercase letters with ascenders and descenders. 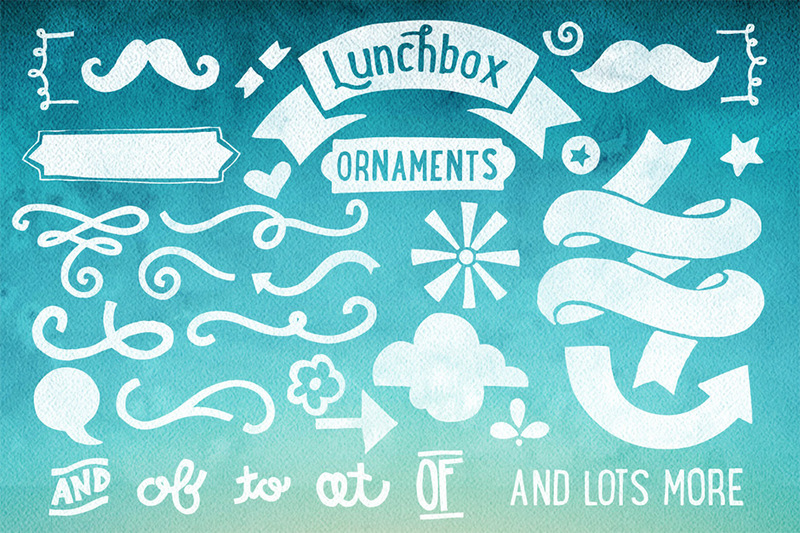 The Lunchbox font bundle includes a bonus set of ornamental designs. These dozens of hand-crafted designs come in vector formats (.ai, .eps, .pdf) as well as their own bonus font family (.otf and .ttf versions). 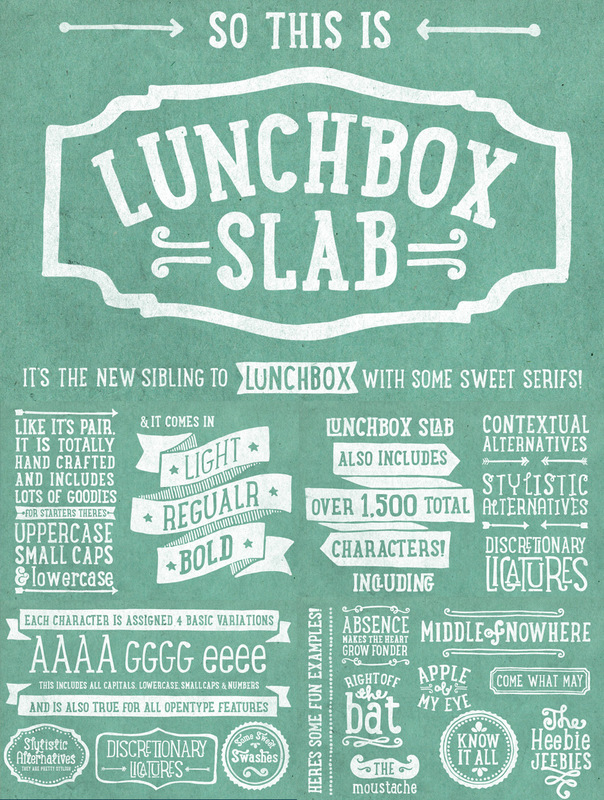 Lunchbox Slab is the pair of Lunchbox, a uniquely hand-drawn typeface that gives infinite customizable options and a fully authentic look. The serifs in Lunchbox Slab are simple blocks, with bulbous terminals on curved letters, which creates a unique effect. Identical to it’s pair behind the scenes, Lunchbox Slab’s Opentype features allows access to over 1,500 different characters. Contextual alternatives give each letter 4 different character styles, all cycling through each other to ensure that no two letters ever show up together. There is also a custom set of small caps, each with 4 style variations as well. Stylistic alternatives give an extra hand-drawn flourish, loop and slight variation, also with 4 different styles per letter. 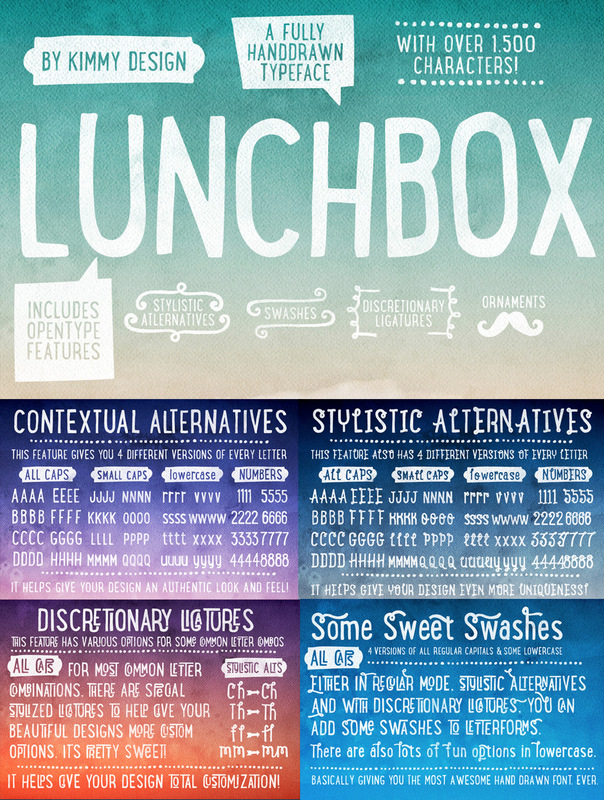 Discretionary ligatures pertain to both regular all caps Lunchbox as well as stylistic alternatives. It gives special letter combinations a unique interaction, giving your design a unique and personalized look without spending hours creating it and outlining your text. Included are also a set of swashes that also have four style variations to both the regular and stylistic alternatives, as well as lowercase letters with ascenders and descenders. All of these options are available in Light, Regular and Bold. 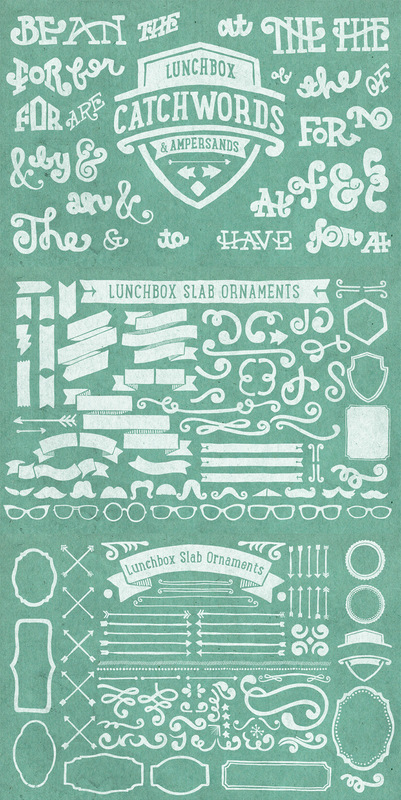 The Lunchbox Slab font bundle includes a bonus set of ornamental designs, even larger than the Lunchbox Regular ornamental pack! These dozens of hand-crafted designs come in vector formats (.ai, .eps, .pdf) as well as their own bonus font family (.otf and .ttf versions). 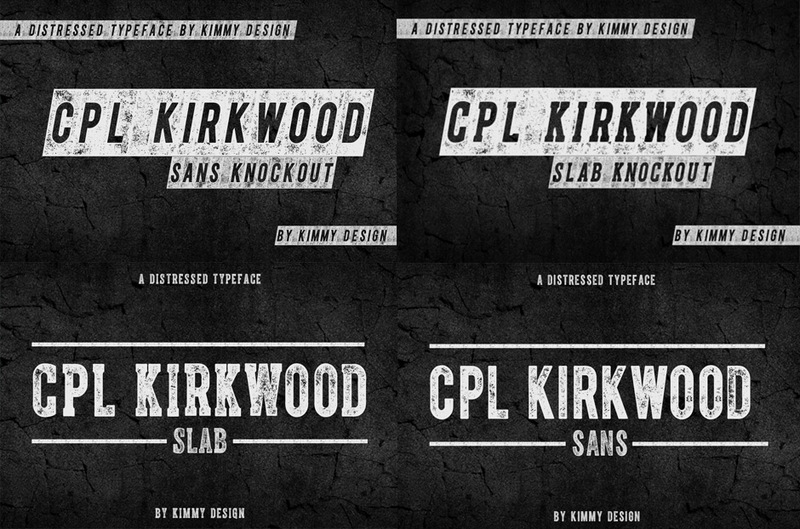 CPL Kirkwood Knockout is an all caps distressed condensed bold sans serif typeface. It comes in several variations and is perfect for adding a grungy, noise-ridden typographic element to your projects. 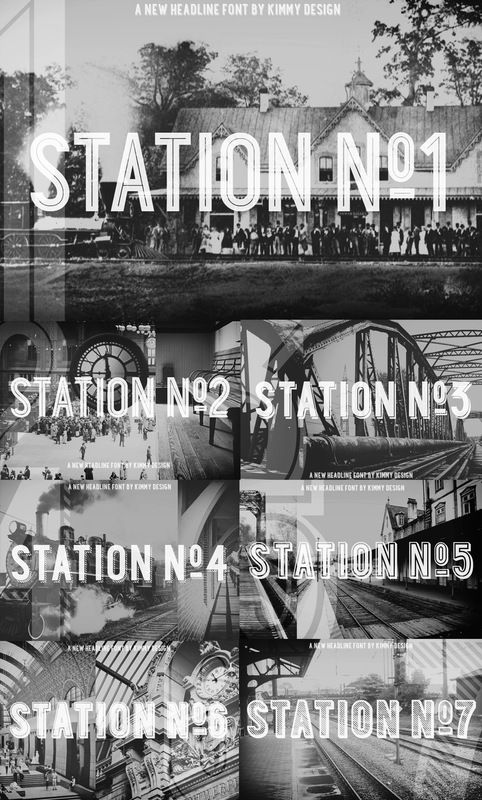 Station is a bold headline typeface inspired by old Train Station type and graphics. It can be used in a modern and retro way, and it’s different patterns and styles give a unique look to any design. This complete font family comes with 7 different versions, giving you ultimate control. 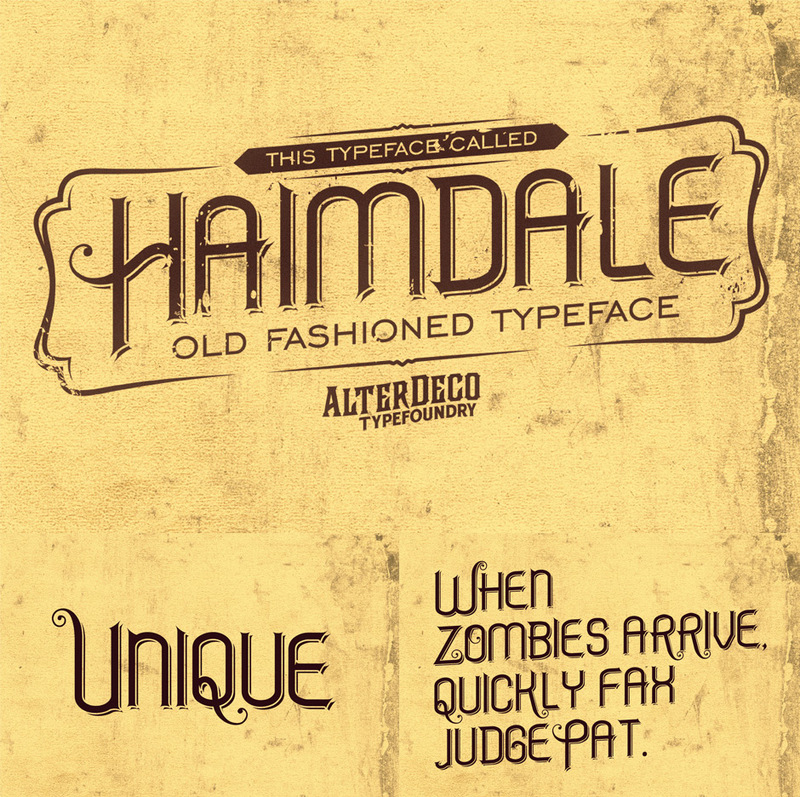 A beautiful old fashioned typeface, inspired by both Victorian and modern typography. 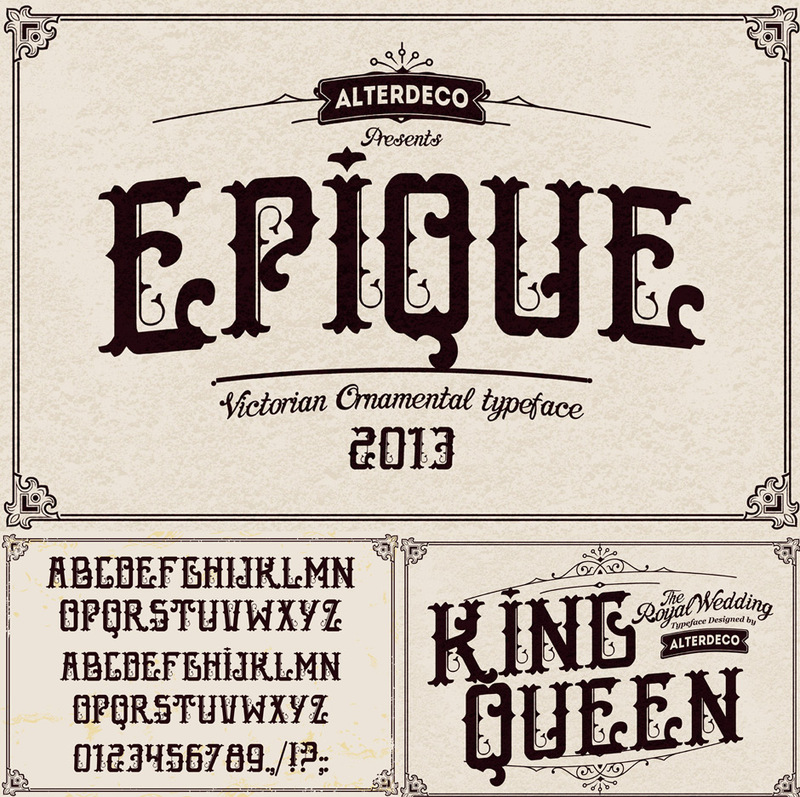 An old style typeface inspired by Victorian ornamental designs and typography. LongMarch is a modern typeface with a retro edge. It’s a strong font choice and great for headlines and titles. 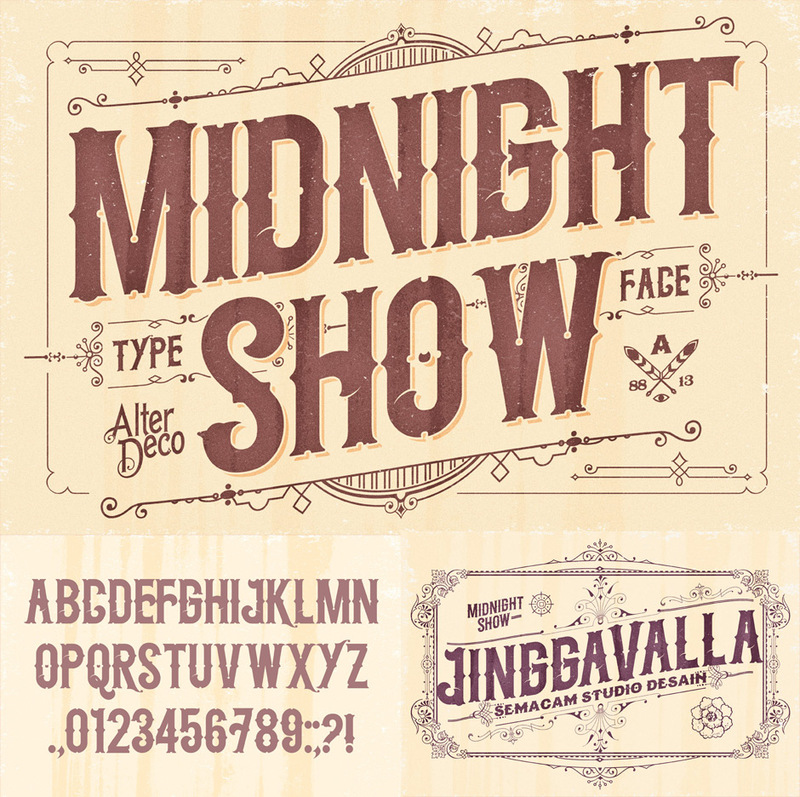 Perfect for logo types and apparel design, Midnight Show is an old fashioned font inspired by vintage sign typography. 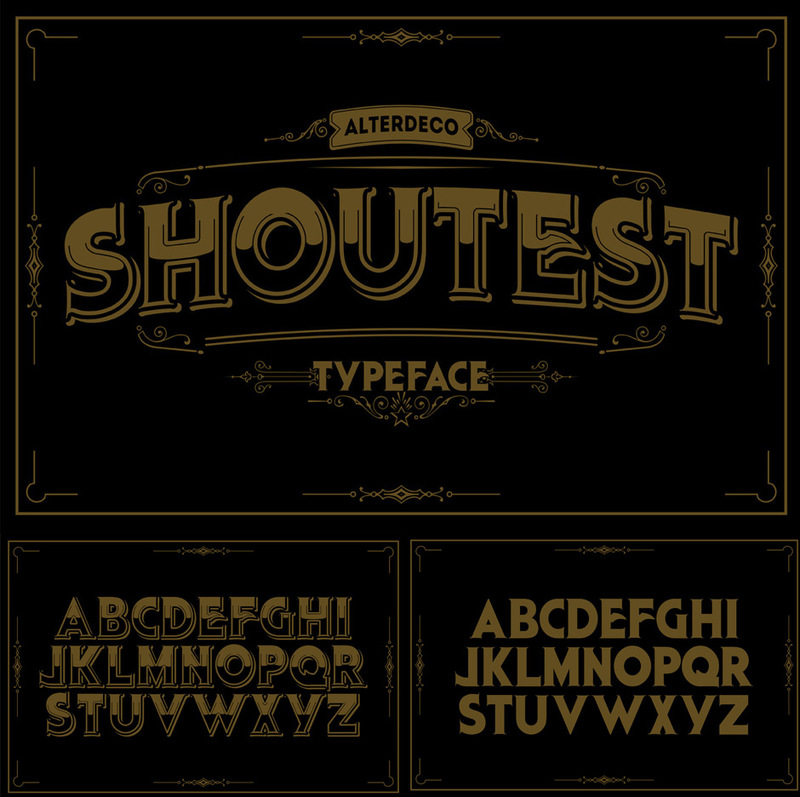 Perfect for your retro style designs, Shoutest lends an element of glamour to your work. Comes in 2 styles – shadowed and non-shadowed. Inspired by vintage block lettering, this bold, all-caps font is ideal for adding impact to your designs. Incognite is inspired by modern blackletter and Mexican tattoo design typography. This gives a unique, but elegant end result, which is part for adding some art-deco style intrigue into your design work. 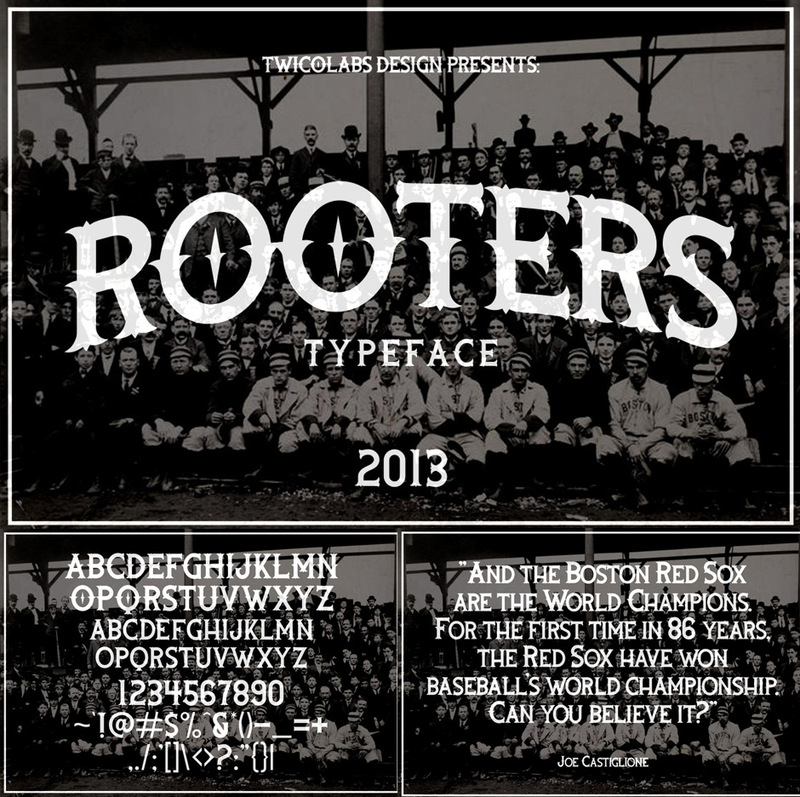 Rooters is based on classic baseball style lettering, with influences of tattoo typography thrown in. It’s one of my favourite fonts of all time, and is so much fun to work with. 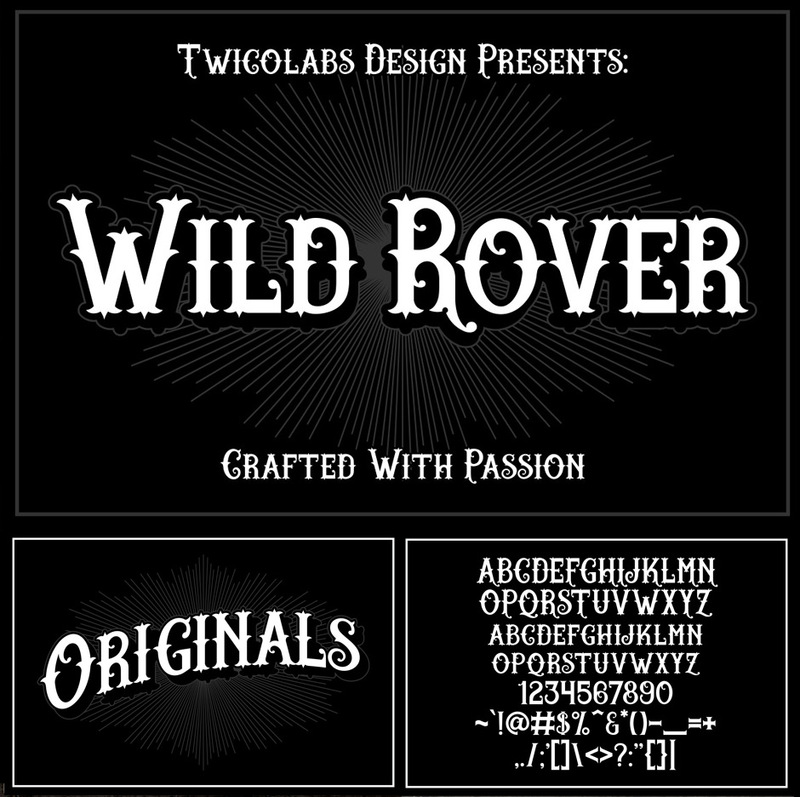 Wild Rover is another beautifully unique font, and quite unlike others I’ve seen over the years. 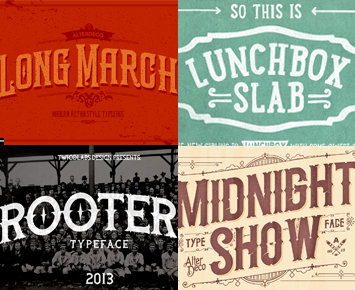 It’s vintage style is inspired by old sign painting lettering. The wonderful curls and details make this font a work of art in itself. 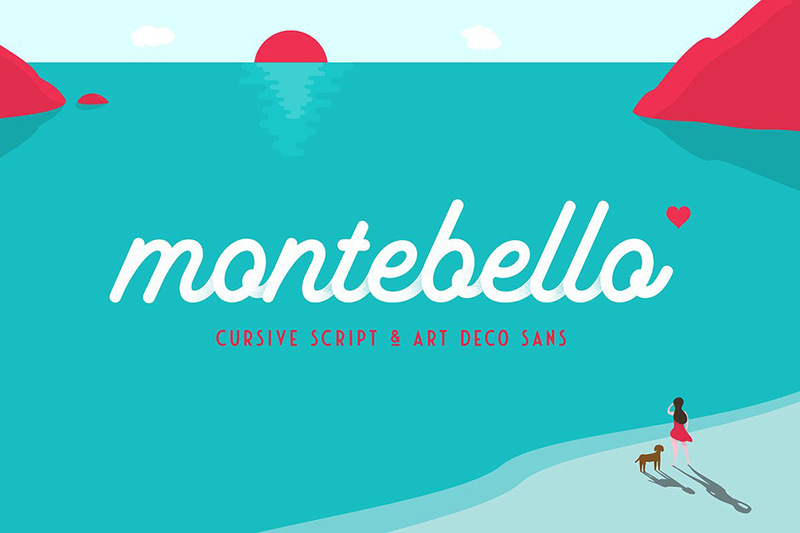 13 beautifully creative fonts. Perfect for enhancing your design projects. Tons of font variations, alternate versions, extras, character sets and vector bonuses. Compatible with Mac and PCs. 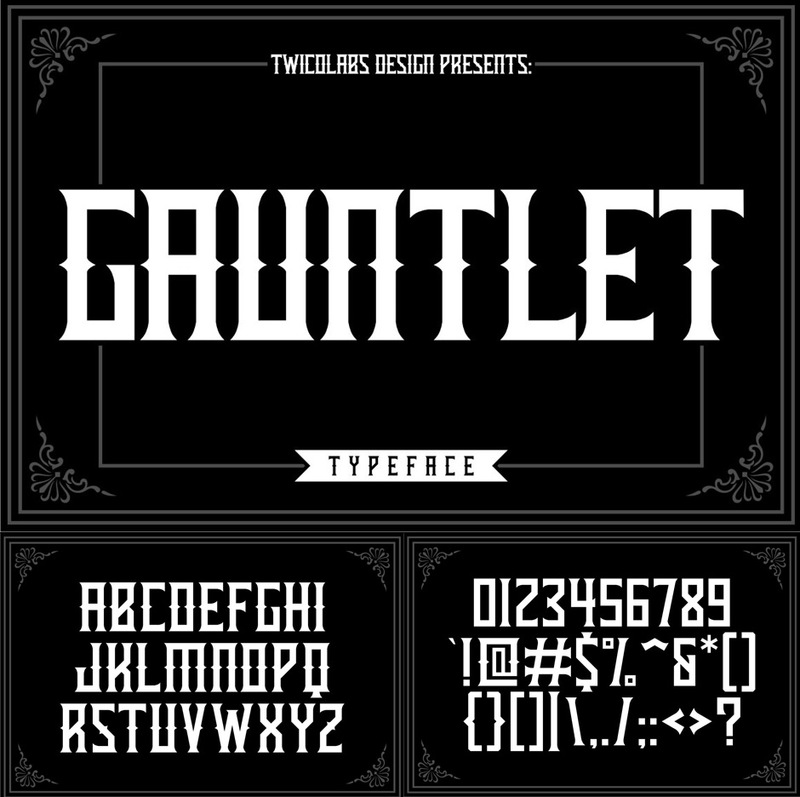 Fonts include .otf and .tff versions. Web versions included (.eot, .svg, .woff - see details above). An unprecedented 94% discount, offering you never before seen pricing on many of these hugely popular fonts. 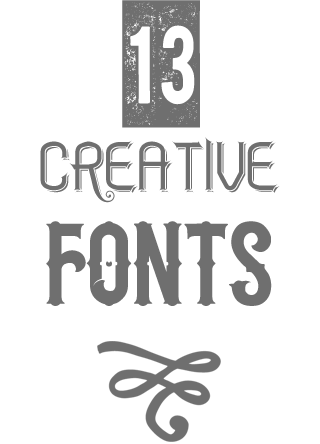 Fonts come in .otf and .tff formats (Mac and Windows compatible). Please bring back this sale!!! Thank you so much for your comment and we are so sorry that you missed this Bundle! Unfortunately we do not re-run our bundles but all is not lost Agustin and I have popped you over an email to help. hi there. any more deals on this one? I’m afraid this deal is now well and truly finished, Craig, however I know we’ll have more font bundles coming up in the future. I’ll also be sure to email you should this bundle be available again as a re-run. Hope that helps. I can’t believe I missed this! So bummed. Wishing I had these for an up-coming project. Hey Prontip, I’ve just dropped you an email. We have another awesome creative font bundle in the works, which I’m sure will benefit your upcoming project. Tom..one more day..PLEASE! I had to get the RAM replaced on my PC and I missed this one. OK, I’m groveling here, but I am willing to for this deal ” Insert high pitched very irritating whine here”. Thanks Carl! At first we weren’t sure it was an option, but after getting so many requests from the Design Cuts community we did our very best to speak with each designer and arrange this in time for you guys. We hope you love your new fonts :). Can these fonts be used in elements 11 to add to photography…how does that work? I have no experience adding new fonts. Hi Joanne! Absolutely. These fonts can be loaded just like any regular fonts, so can be used within practically any software that allows usage of text. I’m emailing you to try and help in your specific case. Can those of us who bought earlier get the update of web fonts without buying the whole set again ? Great question Lorraine! You can login to your Design Cuts account at http://designcuts.com/login and then re-download the bundle. This will include the web fonts, so no need to purchase them again. I hope this helps :). Hi guys, I have purchased the bundle before you have included web fonts in it. Is there any possibility to get them, too? Thanks in advance. Thanks guys. Staying your happy and loyal customer, Lily. Thanks Lily, you rock! Anything we can do to help with your design work, just let us know. I’ve already got my thinking cap on for the next one, as I work a lot with brand design and commercial artwork I was thinking of maybe a brand design tutorial – or a book cover or similar (if the latter then complete with tips for how to get it ready for print, PDF settings, colours, crop marks etc). You’re so welcome Michael, we hope that you love your new fonts. 🙂 I know what you mean, I could have done with more quality resources back when I was starting out. Hopefully these will have a great impact upon your work. They’ve certainly helped all of us in our regular work. I have a clothing company and was wondering if I may use these fonts on my garments to be sold. Absolutely Jin! You only may not resell the fonts directly (i.e. : as font files). We’d love to check out your clothing design work. Please feel free to send us a link. To me, that eliminates the possibility of using the fonts on a garment to be resold, ESPECIALLY if the garment is a Font based design…. This license only applies to purchases via Creative Market, but at Design Cuts we always negotiate a special extended license with all the designers we work with. So as long as you purchased the bundle through us, you will be able to use the resources commercially, as explained by Tom. I’ll send you some more details on that as well now. This font bundle is a must get and something that I’ve been waiting for from DC. I’m looking forward to using these fonts and vector add ons in my work. Thanks DC for showing how the fonts can be used … that really helped in the decision making process of whether to get this bundle or not. Lets not forget the tutorials, freebies and the price … wow. Are the web fonts included for this? Hands down one of the best DC deals yet! The fonts alone are well worth $25, but the additional (and unexpected) banners and vector accessories are so useful. If you design a lot of flyers and especially cover art, this bundle is a steal. The fonts are so versatile and beautifully executed, I can’t wait to use a couple of these for logo designs. Thanks so much Eric. We really did try to go overboard on the value for this deal, and we love each of these fonts too. As always, we’d love to see your work, so please post any logo designs here (or email them across). Cheers! If any of you are sitting on the fence about this font bundle, don’t. Just get it. Believe me, I was sitting there at first debating if I should get the font bundle since I already have the Station family since it first came out and I have some fonts from Decade Type that are similar to the Twicolabs fonts. But, then I saw the Rooters font in action and I knew the bundle is cheaper than many single fonts are on a font site we shall not name. And now that I got the bundle, Rooters is quickly becoming of those fonts I know I will be using frequently. Wow, thanks for the stellar review Justin :). I’m so glad that you’re enjoying the bundle, particularly Rooters, as that’s one of my favourites too. Please do post any of your work here, we’d love to see it.